Traveling has always been something that interests and excites me. I've been a lot of places in the world: Europe, the Mediterranean, South America, the Caribbean, and all over North America, but until now I had never left Canada for more than a month at a time. Some time last year I decided to leave home for an extended period of time, so I applied for a working holiday visa to Australia. I left Edmonton, Alberta, Canada on March 2nd, and after a quick sojourn in San Francisco with an old friend, I flew the 13 hours to Auckland, NZ and then boarded a plane headed for Melbourne, Victoria, Australia. I've been in Melbourne for about 4 weeks now so I figured it's time for a blog update. I've been staying with a Canadian friend in Thornbury, a northern suburb of Melbourne. We share a quaint little house with 3 others: an Australian student, an Italian traveler, and a Peruvian mechanic, all of whom have been in Melbourne for varying lengths. We have a lovely back yard with a huge producing fig tree. During the day the tree is full of beautiful native birds, and at night the bats and possums come out to feast. Last weekend we tried our hand at making fig jam… with moderate success. For the most part, the weather has been HOT. We've had a few days over +35C, and it's supposedly autumn here. Granted, this is apparently unusually warm for Melbourne, but I've been enjoying it. Naturally the first thing I wanted to see were some beaches. During my first week here I went to check out St. Kilda Beach with Jessica and some of her flatmates. We stayed at the beach until the sun started going down, then headed over to the St. Kilda Night Market. We sampled some food, checked out the live music and some merchants, and stuck around to have a few beers in the park and watch the fire spinners. Other than picnics and hanging out on as many beaches as I can get to by train, I've also had the opportunity to see the incredible film Samsara on a massive outdoor screen at The Shadow Electric, and catch some live shows at the Melbourne International Comedy Festival. The rest of my time here has been spent wandering the CBD (Central Business District, what Canadians would call "downtown"), visiting parks, museums, libraries, and cafes. Below you'll see the Yarra River that flows right through the CBD, massive Southern Cross Station, a pigeon loft at Batman Park, trees and seagulls in the museum park, and some cool public art. My favourite area of Melbourne so far is probably Fitzroy, a neat suburb full of cafes, pubs, vintage shops and clothing stores. We've been hitting Fitzroy almost every Saturday night to bar-hop, catch live music and people watch. Bar Open is a really neat venue with multiple floors, a big open courtyard and live music pretty much every night. I actually just found myself a place to live for mid-April in Brunswick, which is north of Fitzroy. In the next few weeks I hope to find some work in hospitality as either a waitress or bar tender. 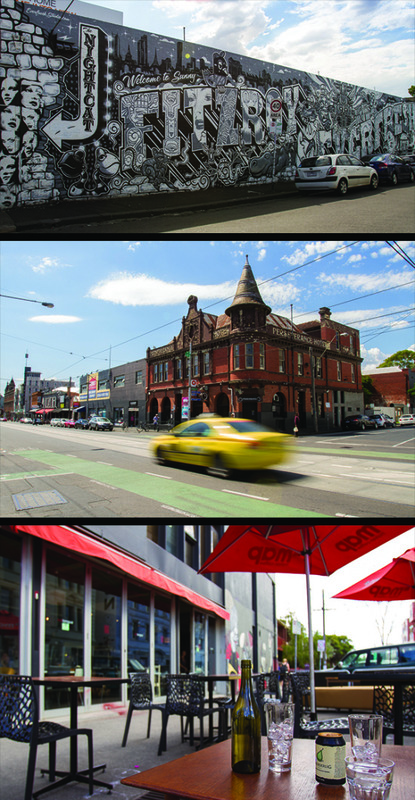 Fitzroy and Brunswick are two really great areas to do just that. The gals that I'm moving in with later this month are into a lot of things I'm into: theatre, comedy, art, and photography to name a few. I'm looking forward to meeting some of their friends and colleagues and expanding my Melbourne network. So that's what I've been up to for the last while! Traveling is so good for my soul. I'd love to do this for years to come, and blog about all the great places I've had the pleasure of seeing.